What is it about this thing that makes it so great? If you break it down it doesn't seem that revolutionary: there's a stove and a cup with a built-in heat exchanger. Sure, everything stores inside the cup, about the size of a 32oz. Nalgene bottle, but that still doesn't fully explain its attraction. But attractive it is, and the key is ease of use. This thing just works. Pull off the lid, pull out the canister/stove assembly (you can leave it connected while stored in the cup) connect it and push the lighter button. Presto, you've got a rolling boil in a minute or two depending on air temperature. You can drink right out of the mug with its insulation jacket and hand-strap. 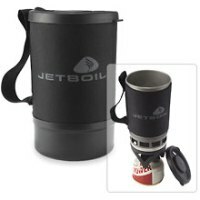 I had difficulty getting a Jetboil to actually boil when the temperature was in the single digits, but for "normal" use in the teens and above it's hard to beat the Jetboil's simplicity and convenience.